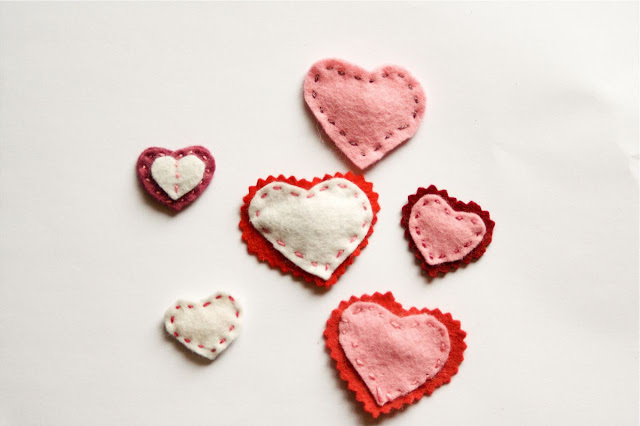 i'm kinda surprised that I haven't convinced myself that I need to make a valentines quilt. it would be so cute with red, white, and pink. i'll have to think about that for next year. why not right? my daughter and I made these fun hair clips (tutorial here) a week or so ago, and i think they turned out adorable. fun little project to do with my daughter too. i did adjust the size to better fit my daughters hair. The tutorial is for tiny clippies (about 3/4 inch), but they just don't stay in my daughter hair, so we used 1 1/4-ish inch clippies. Super cute. p.s. is anyone out there playing words with friends?? i'm addicted. my username is nettiepete if you want to play. I love words with friends! And those clips are adorable! Now I just need a little girl and I'm set! Oh, words with friends is great. I only have my father in law to play against though, so I might need to add you for a game! My username is Kristafleck. Those clips are super cute. Seeing things like that makes me wish my girls were little again! There is no way they'd let me put clips in these days. those look so cute! i remember seeing the tutorial on purl bee, but forgot about it. i'd love to make some though....maybe for next year when my daughter has more hair. Your sweet clips were on my good intentions list. They didn't get done by VDay, but I'm still going to make some. 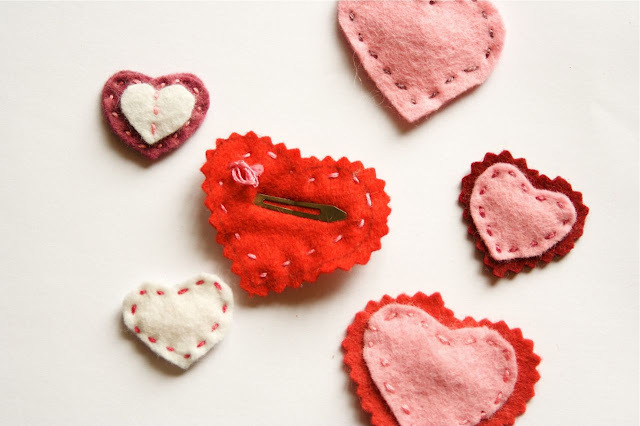 They are so cute, and I think heart clips would be darling any time of year. Very clever! i just found you after a lot of hopping from camille to stash to block party and now here. something like that! your finished quilts page is quite inspiring. what a great range of quilts. i'm just getting my feet wet on the scene. thanks so much for sharing. So cute. Have you considered adding buttons?